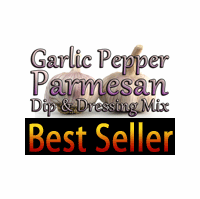 Garlic Pepper Parmesan Dip Mix & Dressing Mix by All Mixed Up, Ltd. 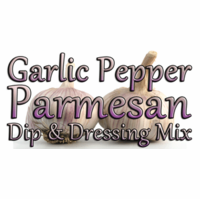 Plenty of zesty garlic, black pepper, and Italian herbs in a creamy Parmesan dip. Also tastes great as a pasta salad dressing, spread on Italian bread and toasted for a cheesy garlic toast, mixed into mashed potatoes, and much more! No MSG. Gluten Free. Vegetarian.